Hey guys. I am finally going to finish my lure. I need some help getting started. How do people get the scale affect on their lures? I know they use a mesh of somesort, but what color do they paint under that BEFORE they spray the mesh? Im getting close to the end of my first lure! Its been awhile since Ive been on here due to school and also football, but i put the ballast in right where you said and it sits very good in water. The next step for me is painting and finish coating it as well as install the bill. other than that, ill be good to go. Any tips on that will be great and ill post a pic of when Im done. Sanding Sealer Help. Sealing Your Wooden Lure. Wow those look great!!!! What tips do you have! Thanks ill look into that! Hey I need some help. I am painting my lures with rattle cans. What would be a good brand? Rustoleum? what should I look out for? I sealed my lure with Sanding Sealer (minwax). Also, I need something I can just dip my lure in and let dry after I paint it for a topcoat.. Any suggestions ? After reading what you guys said, I went ahead and got some waterproof epoxy. I just dabbed the shaft of my screw eye in the epoxy and inserted it into the hole. I kept doing this until I was sure that the epoxy had filled up the hole. It ended up working amazing. Hey guys. Just a quick question. I just went out and got some sanding sealer. How do I use this? is it ok to just dunk it and let it dry then dunk it again about an hour later? Also, AFTER I seal it, I need some advice on the spray paint rattle can style babbbyyyyy. Things such as colors and brands would help a lot. Im nearing the end of my first lure! Hey guys! as some of the more active people on this forum know, I am nearing the end of my first lure! But first, I have to seal it before I paint it. What should I use to seal it? I don't want to thin anything out. Is sealing a process I can do by just dunking it in something and then letting it dry? I don't have a rotational dryer either. I am using Rattle can spray paint no airbrush for painting. But I need to know what to seal my wood lure with. Also, I need to get a bill yet for it. Any Reccomendations? I want it to run pretty shallow. Yeah this is my first carving and sanding of a crankbait. I have to say it looks pretty good other than the tail is a bit flat. Ill learn as I go. Anyhow, I have heard some people saying a split shot is a reasonable thing to use as a ballast. Would I just drill a hole the size of the split shot, insert the split shot in the hole, then fill it in? Thank you! This will save me a bunch of time. I get what your talking about now. I made the mistake of drilling a 1/16 pilot hole and tried putting 7/16 diameter screw eyes in that I bought.I think they're to loose. If I just epoxy the holes and the screw before putting them in they'll hold fine? I don't have line ties. Like I have holes drillled. your reccomending me fill in the holes with epoxy and then push my screws in that later? Will that hold up to a good size fish? I drilled a 1/16th hole and my screw eyes are 7/16. Am i in trouble. 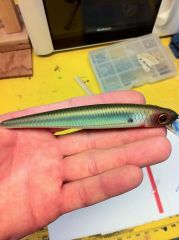 What would you consider to be a small lure. So right now I plan on sealing the lure, then putting the screw eyes and hooks on and seeing how it sits in water?